Are you an undergrad who enjoys creating things? Seeing how far and fast you can take an idea? If so, why work for someone else’s company this coming summer when you can create your own? 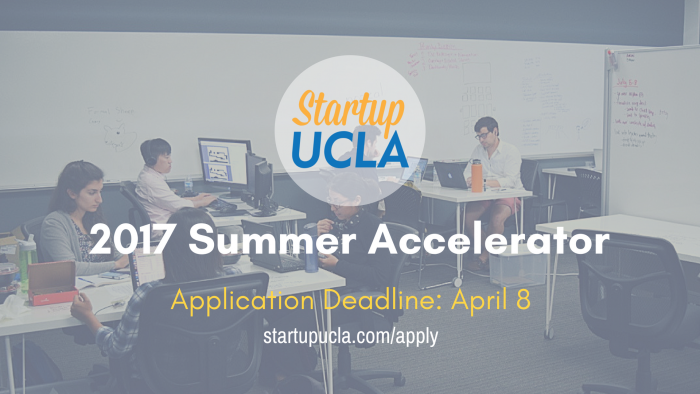 Startup UCLA’s Summer Accelerator is a ten-week program where UCLA students and recent alumni are provided $5,000, office space, and connections to industry professionals and mentors to work on their early-stage startup. Unlike most accelerators, Startup UCLA takes NO equity in your startup. The accelerator starts July 5, 2017 and finishes with a demo day on September 7, 2017. This is an amazing opportunity to create your business, learn from top entrepreneurs, investors and subject matter experts, and make long-lasting relationships with other Startup UCLA entrepreneurs and alumni! The ideal candidate will have a passion and knowledge of a particular area, or be willing to work with the Startup UCLA team around a new idea that can be launched during the summer. While helpful, no startup experience is required – we are more concerned with your dedication and desire. You may or may not have other team members working with you, but ideally you have a co-founder that complements your particular skill set. We encourage balanced teams, which may include business, design, engineering and other disciplines. During the ten weeks, you’ll work with our expert team and guest mentors to refine your concept and (especially for existing businesses) determine new metrics for success. You’ll work alongside 8-9 other startups in the 2017 cohort comprised of high-caliber UCLA students, alumni, and their team members. Year-after-year, we find that one of the most valuable and enjoyable aspects of the program for the teams is collaborating, bouncing ideas off of, and challenging one another. The best work is done when the group (usually 15-20 people) is tight-knit, so we setup social events throughout the summer to encourage this. We also take a trip to Silicon Valley, where you’ll visit the offices of high-profile startups (we’ve visited NerdWallet and Facebook in past years) and pitch in the offices of prominent venture capital firms (such as Lightspeed Venture Partners, Mithril Ventures, and Institutional Venture Partners). The accelerator culminates with a demo day at UCLA where you pitch to a crowd of hundreds and network with investors and alumni to further your startup. Startup UCLA doesn’t end there though. As an alumni of the Summer Accelerator you’ll be part of an exclusive network of the more than 40 companies and 150 people who have gone through the program since 2012. Three Startup UCLA companies have been acquired and eight have either received outside funding from the likes of Tim Draper, Steve Case, Marc Benioff, and Troy Carter or are profitable. Alumni of Startup UCLA have gone on to work at Uber, Facebook, Google, and Buzzfeed, to name a few. Meet top entrepreneurs. Past speakers include Natasha Case of Coolhaus & Brian Lee of The Honest Company.